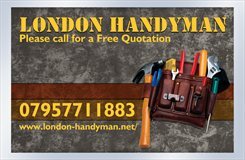 London Handyman can turn up and carry out work immediately or visit you to give you a free quotation. No Job too Small. Competitive Pricing Safe person to employ (Enhanced CRB) Call London Handyman. London based residential and commercial property repair and maintenance service. Brickwork, plumbing, carpentry, flat pack, guttering, painting, plaster repair, fixing, repairing, installing.